I'm a guy and we don't ask directions, so I figured I would be able to find the church behind the Hilton Garden Inn, site of this year's ECOF huckster room, all by myself. One problem is that in California every building looks like a church, with its imitation adobe outside and the rounded red brick roofs on top. Behind the Hilton is a strip mall but I soon spotted my target (no, not the Target store), but the DisciplesChurch (all one word) with Disciples in blue and Church in white, looking for all the world like a sign for Toys R Us. It was right next to Fashion Nails, so hard to miss it! Today the boys (okay, AND girls) were setting up for the big event. Got my stuff spread out, sold one item, or maybe two, to early birds. But fret not, ye late arrivals. I think all of the McClurgs in jacket that I saw are still there, ripe for the picking on Saturday. Finally headed back to the barn at 4:30 and noticed a sheriff's office bus parked along the street and a couple of Highway Patrol cars in the parking lot with real uniforms and real guns. Either the police are also having a convention this weekend or they have heard we are in town and have come to round us up. Not sure which. Will risk meeting some others in lobby at 5:30 so we can go to Chili's for dinner and hope we are not dragged off in irons. After that, early birds will be treated to some DVDs of old TV shows that have Tarzan actors (Jungle Jim, Yancy Derringer, and others). I fully expect to fall asleep during this marathon as it's been a long day. ECOF: WHERE THE ACTION IS . . .
A no-holds-barred brawl broke out at the ECOF Friday night. Fortunately, it was only a fight between two actors who were playing roles of one of Bradley's crew members and Captain von Schoenvortz's second-in-command. A pretty good fight, though, as they whaled away on each other until they ended up in a pool of mud and oil. It was movie night for the second night in a row at the ECOF, with some of the episodes of The Adventures of Tarzan playing first. Alas, it ended with a cliffhanger after Elmo Lincoln fell into a den of hungry lions, despite shouted warnings from some ECOF members who tried to alert him that he was walking right into a trap. After that, we watched some brief clips that were censored from the original King Kong. Apparently the censors didn't like scenes of Kong grabbing people and sticking them in his mouth and biting off their heads and then throwing them on the ground and stomping them. Even worse, he looked as if he was having fun doing it. He also became extremely interested in peeling Fay Wray's clothes off one layer at a time, although the lady's dignity was preserved. But the very idea of the big ape removing even part of a gal's clothing was beyond the pale, as far as the censors were concerned. It was then time for "The Land That Time Forgot" with Doug McClure and Susan Penhaligon surviving long enough to toss in a message in a bottle off of a cliff. But there were no fights among ECOF attendees themselves or, at least, none that I eye-witnessed. Everyone seemed to be getting along quite well with everyone else, and happiness shone from the faces of many who were able to add new treasures to their collections as well as because they were seeing old friends again or making new friends. I then pretty much abandoned my table of for-sale stuff as I prowled around seeking autographs in the books from those who were there to sign. Thomas Zachek was one who was there and he signed my copy of his Tarzan Trilogy and Lee Strong signed Soldier of Poloda and Untamed Pellucidar. Other signatures were obtained from Thomas Yeates, Mike Royer and Dan Parsons. It was also nice to meet Jess Terrell, a co-moderator of For the Love of All Things Edgar Rice Burroughs. I'm glad that Jess has been posting photos of the goings-on. I am unable to, due to the fact my cell phone has decided, at least temporarily, not to forward photos to my email account! --Ralph Brown narrated a slide show of photos of many of the Tarzan doodads that are in his collection, and he told amazing stories of how some of them were acquired. --David Lemmo read poetry by friend Rachael Wenban, and yours truly read some of his own ERB-related poetry as well as some by ERB. --The Plastic Mangani Band, with Lemmo, Wenban, John and Paula Pappas, Thomas Yeates and Bob Zeuschner, sang several ERB-related songs. Lemmo and Yeates did the major vocals, with backup singing by others. The official ECOF banquet was down the road a piece at Fats, and was family-style Chinese food and energetic chatting. Kudos to the North Coast Mangani, headed up by Don Gray, Steve Baran and Tom Tolley, who are doing a terrific job of hosting this ECOF. The ECOF rolled successfully through its second and final day Saturday in the backyard of the Hilton Garden Inn in Folsom, Calif. 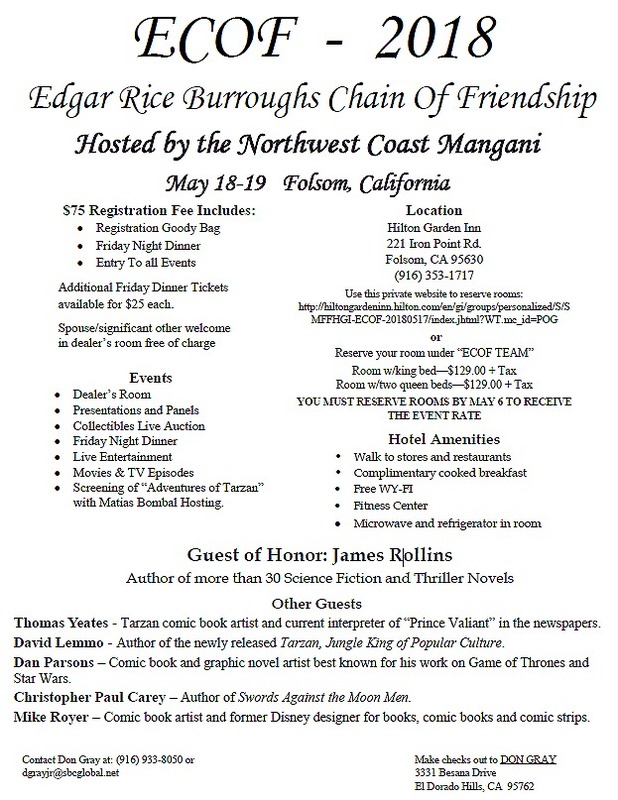 The hotel lobby doubles as the dining area and, since the $12.95 breakfast is free to hotel guests, most of the ECOF attendees ate right there both Friday and Saturday, May 18-19, , while engaging in stimulating conversation about the worlds of Edgar Rice Burroughs. And when each determined the time was right, they would leave and walk from the hotel over to the Disciples Church for another round of ERB activities at the ECOF (the Edgar Rice Burroughs Chain of Friendship). After breakfast, my first stop this morning was at the Edgar Rice Burroughs, Inc., table, where I leafed through all four volumes of the display copy of Michael Tierney's ERB Art Chronology, and decided that it was well worth joining the many who have purchased it, which I will arrange to do so in a short while. At 10 a.m. it was time for Jim Sullos, president of Edgar Rice Burroughs, Inc., to give a report on current and future projects for the company. He began with a history of the Tarzan musical stage play, which opened a few years ago with a run on Broadway which wasn't quite as popular as was wished. But once the play transferred to The Hague in The Netherlands it was hugely successful, and that run was followed by equally popular runs in Hamburg, Germany, and then Stuttgart. And, there was good news back in the states, too, as many drama teachers and students throughout the land were choosing to do the musical in their high schools, so the youth of America are getting familiarization with the ape man and his story in that way if no other. Sullos also said a new Tarzan movie is never far from their minds, and they make contact with the option holders at regular intervals. Many times, he noted, it's a waiting game -- waiting on Hollywood, that is. Another venue for Tarzan is a computer slot machine game in Las Vegas, which has proved extremely popular and helped generate revenue to "pay the bills." After five years of putting new Burroughs comics on its website, the firm has plans to add yet more strips, including one on ERB's story, "Beyond the Farthest Star." The purpose of the web comics is "to give visualization to everything Edgar Rice Burroughs created. We want the world to understand this man was incredibly prolific," said Sullos. He gave a shout-out to Martin Powell, regular writer of about one-third of the current strips, "who talked me into going beyond Tarzan" when the strips were first getting off the ground. "He's a savior of our program," Sullos said. Sullos reviewed the titles published thus far in the "Wild Adventures of Edgar Rice Burroughs" series. Stories which generally stay within the parameters established by ERB are designated as part of the "Wild Adventures" series, while others, which may not quite fit into that pattern but are still stories worth reading, such as The Martian Legion, Tarzan and the Cannibal King, the new La of Opar, etc., are not so-designated, but are still authorized and made available to fans.  There is no official designation for stories that fall into that category, although some of them might be considered "alternate universe"-type tales. Speaking of future books, Sullos mentioned the ERB Art Chronology, and said that Thomas Zachek will have a story titled Tarzan and the Revolution and Lee Strong is working on one to be titled Kirov of Pellucidar, a sequel featuring a character from his just-published Untamed Pellucidar. He also mentioned that some other new book prospects are in the works. Another avenue for ERB stories might be the small screen with mini-series. Discussions are also under way about those possibilities. Later in the day, it was the turn of James Rollins, the ECOF guest of honor and N.Y. Times best-selling author of 35 thrillers plus some fantasy fiction under the nom de plume of James Clemens. Rollins said his dream as a young man was to become a veterinarian and that Tarzan helped give him an interest in communicating with animals. He was fascinated with the ape-English dictionary in the back of one of the Tarzan books he had. But he also had become the "de facto" storyteller to his six siblings and would often regale them with tales he had come up with off the top of his head. Thus was born his desire to write and share his stories with larger audiences. He began doing this even while operating a veterinarian practice and eventually decided to devote himself exclusively to writing. His first novel was titled Subterranean, which had an ERBlike flavor with "five characters going two miles deep into the earth. Throw in monsters and shake," he quipped. Forty-nine literary agents rejected his first story but he was persistent and the 50th liked what he'd read and his career was on its way. He noted that ERB didn't confine himself to one type of locale, but "Burroughs was in space, in the jungle and underground. I like being in different places too," he said of the types of settings in which he places his characters. 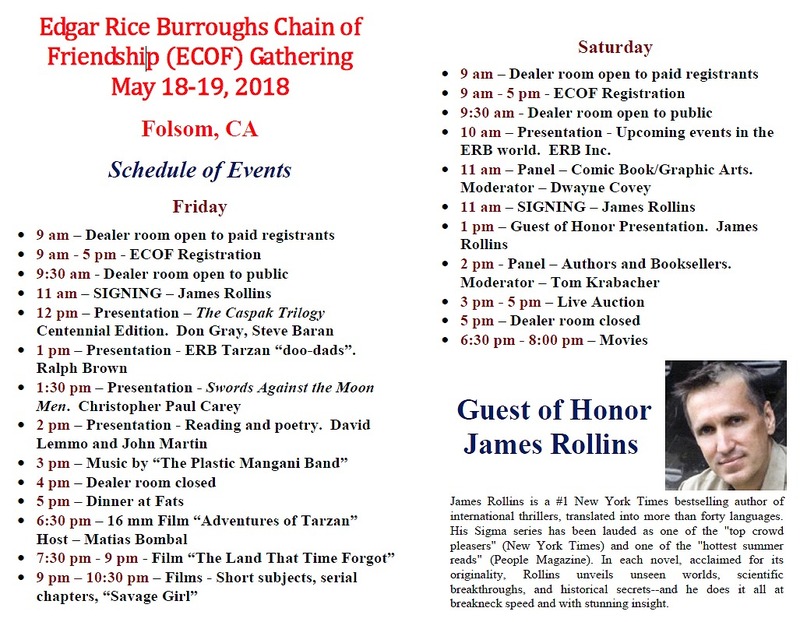 Two other panels took place, one featuring artists Thomas Yeates, Mike Royer and Dan Parsons, and the other featuring five authors of new ERB-related books. The artists shared behind-the-scenes stories of working with other famous artists, such as Alex Toth. The five authors were Jim Malachowski, Song of Opar; Gary Buckingham, author of a short Tarzan story that is included in the hardbound edition of Will Murray's Tarzan: Return to Pellucidar (he has just written a longer story which may be published); Christopher Paul Carey, Swords Against the Moon Men; Lee Strong, Soldier of Poloda and Untamed Pellucidar; and Thomas Zachek, Tarzan Trilogy. Each explained their own journey of appreciating ERB and eventually being able to write stories including his characters or worlds. A major event at this year's ECOF was the presentation of the Burroughs Bibliophiles OUTSTANDING ACHIEVEMENT AWARD to BOB ZEUSCHNER: The ECOF ended with the traditional auction of books and other items donated by huckster room dealers, with the proceeds going to the ECOF organizers to compensate for money spent in setting up the ERB event. Those doing Numa's share of the work were Don Gray, Tom Tolley, Steven Baran, Dwayne Covey and Tom Krabacher.